September 14th 2012, Slim’s, San Francisco CA: This summer I’ve been spending my time up in my high school home, the San Francisco Bay Area. I’ve been able to attend a huge amount of shows up here. They’ve ranged from sold out amphitheaters to empty rehearsal spaces, but every one of them has been an occasion that I do not regret taking part in. Last Friday night I saw my last Bay Area show of the summer at Slim’s- my all-time favorite venue. On the bill were AC/DShe, Hell Fire, and Space Vacation: all three acts hail from San Francisco, and all three delivered spectacular sets. For me, this concert was a perfect goodbye to my beloved Bay Area. For everyone else, this was nothing less than a amazing Friday night in San Francisco. Slim’s is a venue that I can’t say enough great things about. The tickets are cheap, the bills are consistently stellar, the staff is extremely nice and courteous, many concerts are all-ages and every show is extremely well organized. This show was no exception- the set times were accurate within mere minutes, the sound was impeccable and the audience members were treated with respect and care, no matter how unruly they occasionally became. I wouldn’t recommend ordering the terrible pizza at the bar, but that’s a pretty minor blemish on what I otherwise consider the best venue in San Francisco, if not the entire Bay Area. Space Vacation came on promptly at 9 PM. I knew that the band was a NWOBHM influenced act, but other than that I came to the show completely fresh to their music. The band absolutely delivered on that notion, but it would have to take more than NWOBHM-inspired songs to win me over. Win me over they did however. Singer and bassist Scott Shapiro boasted a Lemmy-esque bass sound, but his vocals were anything but similar to the man. Scott’s singing was instead more reminiscent of Diamond Head’s Sean Harris and the passionate delivery of Phil Mogg from UFO. Scott made sure to throw in a few high screams though, and the band really made the UFO influence known by throwing in a killer cover of “Doctor, Doctor.” The music was admittedly not nearly as heavy as I was expecting, but I was happy to hear a band playing catchy hard rock songs without resorting to mindless thrashing. It’s ironic in a way, because drummer Eli Lucas also plays in Hatchet, a thrash group. Seeing Eli play in a more stripped down and swinging style was a delight, and he even managed to do a great job assisting Scott with backing vocals. The songs ranged from mid-tempo rockers to proto-thrashers, but they were all catchy and full of melody. The older audience who had come for AC/DShe were very receptive to Space Vacation, and the band’s 45 minutes onstage were a great start to the rest of the night. Next up was Hell Fire – a young classic metal band that has been making waves in the Bay Area metal scene for the past two years. The band has already gained approval from the likes of Gary Holt, Mark Osegueda and Aesop Dekker, but they still managed to win over this packed house with a stunning show. I had seen Hell Fire open the Bonded By Baloff event months ago and I came out of that show impressed, but the set they played at Slim’s on this night utterly obliterated the one I had seen months ago. There’s a lot of factors that may have played a role in this happening. For one, Slim’s was jam-packed with older fans that loved the thrashy, yet still rocking style of metal played by Hell Fire- the crowd went wild for the band, and responded to every guitar solo and power scream by Alex Orozco with a wild cheer. There was also the new addition of guitarist Jon Mendle to the band. To be blunt, his soloing was some of the most fluid, clean and downright fast I have ever seen from a player his age. Jon’s dueling solos with his partner Tony Campos were absolutely stunning, but even better were the harmonized solos that the two would play together (don’t think I didn’t catch that homage to “Phantom of the Opera”). Tony’s stage presence remains a highlight of the show, and it’s something that I really look forward to seeing Jon match as he plays more shows with Hell Fire. I was also actually able to hear Herman Bandala’s bass playing this time around, and I was honestly really amazed by what I heard. His playing was extremely busy and quick despite playing without a pick, and his occasional triple riffing with Tony and Jon was quite frankly pretty badass. Alex was also a much more active presence onstage this time around, constantly working the crowd, headbanging and waving his arms about. I’ve already praised his astounding singing ability, but this show really saw him succeed as a frontman as well. If I had a complaint though, I really wish that I could have heard him better. Alex was certainly audible, but having him be just a couple notches higher in the mix would have let every single scream pierce the air perfectly. Hell Fire seemed to have played a few faster songs this time, drummer Arturo Rios’ feet were given a total workout by the end of the set. This set saw a band much closer to early thrash metal than the one I had seen so many months ago, but I would be happy to call this a fair middle ground. At this point in time, a Hell-Fire set is almost like a snapshot of the very early Bay Area thrash scene circa 1981. It’s the sound of NWOBHM made just a little faster and heavier, but not quite at the level of brutality that the Bay Area scene became known for from then on out. Among the songs played, one could definitely tell which ones were older- “Islands of Hell” and “Night Terror” were more on the cheesy and anthemic side of things compared to scorchers like “Lightning Axes” and “Metal Masses.” Hell-Fire’s newer material is a quantum leap in greatness above the songs offered on their current demo, and I would really like to see the band eventually fill their set with nothing but these new songs. Nearly everyone in Slim’s was able to appreciate their cover of “Phantom Lord” though (Art gave Lars a run for his money on this song), and the audience was noticeably upset when Alex announced that the band had only one song left. Hell Fire’s 45 minute set was one of the best supporting sets I’ve seen all year, and I can’t encourage these guys enough to come down to LA and show those crowds the great metal that the Bay Area has to offer. 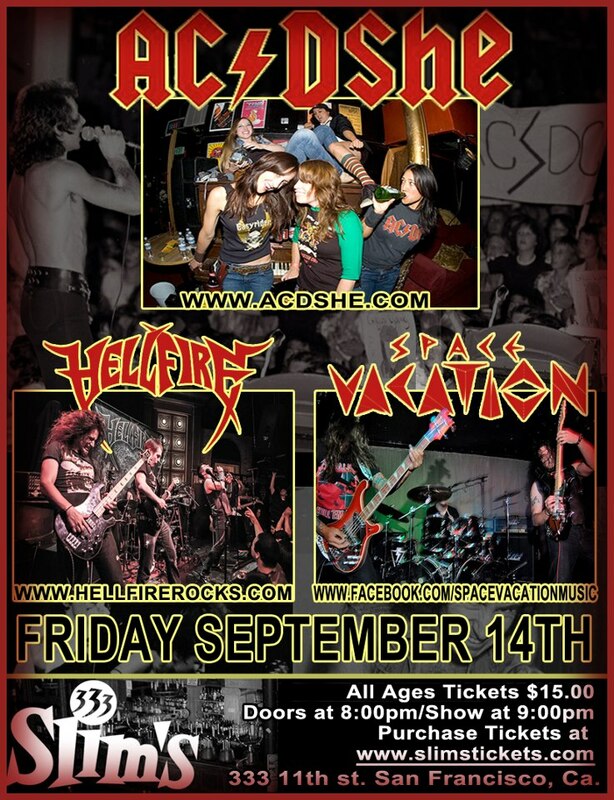 The headlining act on this night was the one that most of the audience had come to see- AC/DShe, an all-female AC/DC tribute band dedicated to playing tracks from only the Bon Scott years. This era of the band is the one I listen to most (and the one that radio hasn’t quite played to death yet), so I was more than happy to hear a full set of ’70s AC/DC. Being a tribute act, AC/DShe also made sure to try and look a little like AC/DC as well. Singer Amy Ward was decked out in denim and waved her microphone just like Bon used to do. Her voice honestly didn’t sound very similar to his, but she had his onstage swagger down pat, and sang the tunes well. Sara Brownell and Nici Williams ended up being the most convincing in their roles of Malcom Young and Cliff Williams respectively. Nici even rocked her full shock of hair back and forth just like Cliff. Pamela Ausejo probably had the toughest job in playing a live version of Angus. Just like Angus live, her solos were sloppy, but her phrasing and tone were unbelievably close to the originals. Pamela was also just as hyper as Angus himself onstage, and had his duckwalk down to a T. When it came to the performances, Tina Gordon ended up surprising me. Her drumming was nowhere near as simple as Phil Rudd’s- she threw in the occasional tom fill and actually played a decent variety of rock beats. It didn’t bother me too much, but when a drummer is so famous for playing the same beat on every single song for over thirty five years, it’s impossible not to notice a less than perfect imitation. As for the song selection, I thought the band did a truly fantastic job of mixing classics, deep cuts and fan favorites within the span of 90 minutes. Even when they opened the show up with a track that I wasn’t immediately familiar with, “Riff Raff,” I knew that the crowd was in for a treat. The show began to go on a bit late, and sadly the audience dwindled throughout the night from around midnight onwards. The show was right on schedule, but it was simply set to go on a little too late for many of the patrons. The fans who stuck around had a great time however (it was actually pretty cool to see a pit during faster songs like “Beating Around the Bush”), especially one fan who continually made his way onstage to rock out with Amy. Listening to the immortal songs like “Highway to Hell,” “Dirty Deeds” and “TNT” was enjoyable, but I really found the most fun in hearing the songs that AC/DC rarely or never performed. “Kicked in the Teeth” was especially great to hear in that regard, as was “Touch Too Much,” “Sin City” and “Walk All Over You.” I could honestly name half of the setlist as highlights, just because the song selection was so phenomenal. There wasn’t a bad track chosen, and many of them have been unjustly ignored by the real AC/DC. Even though I found myself missing “Big Balls,” I can understand why they didn’t play it. As great of a song “Big Balls” is, hearing it performed by a band of women would have been at least a bit awkward. Nearly all the songs were killer in the live setting but weirdly enough, “Whole Lotta Rosie” sounded very off to me. It was almost as if Sara and Pamela weren’t playing the main riff right, and the song felt just a little too sloppy to me. Regardless of this issue though, I had a great time watching AC/DShe’s set- a much better time than I expected a tribute act to offer anyway. This show ended up being far more than the sum of its parts. The bill was perfect, offering three hours of classic heavy metal and hard rock for only fifteen dollars in a venue that is nothing less than spectacular. If what my colleague Jason Coldiron wrote about the Anthrax show in Sacramento happening this same night is true, I’m more than happy that I attended this show instead. As bands like Slough Feg and Hammers of Misfortune enter their middle years, I know that young acts like Space Vacation and Hell Fire will proudly and ably wave the flag for traditional heavy metal in the Bay Area. Los Angeles has some lofty standards to live up after the many great shows I’ve seen up here, but I know that the Bay will continue to thrive and churn out great music while I’m gone. 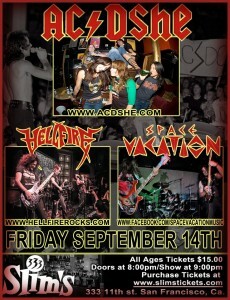 This was a great night of music to be sure, but an even better farewell to the Bay Area’s heavy metal scene.